Is anyone still listening though? The Twitter Music website has been given pretty large overhaul, which may make the site more appealing to some of its early detractors. The new Twitter Music site has added a raft of new chart categories, following criticism that it only served up mainstream artists and did not fulfil its intended purpose as a useful music discovery tool. Now, the site features an Emerging category, for the best new emerging music and Unearthed, which claims to find talent 'hidden in tweets'. Alongside the Superstars and Popular categories which continue to serve-up household names, there's also a Hunted category, which brings music popular in the blogosphere. 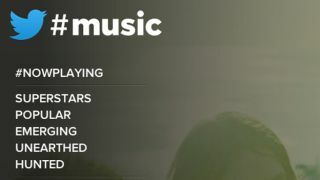 Beyond the chart expansions, users can now jump straight into their favourite genres, to find the most listened to music to suit their particular tastes. The web version is live now and we can only assume that the changes will be coming to the mobile app sooner rather than later. Have you had a chance to have a play? Do the changes address the problems? Do you think Twitter Music is moving in the right direction now? Let us know in the comments section.